You may receive updates from Stop the Williams Pipeline NY (NESE Pipeline) Campaign organized by 350BK, Surfrider NYC Chapter, Sane Energy Project, Food & Water Watch, New York Communities for Change, United For Action and NY/NJ Baykeeper, the sponsor of this petition. Williams Transco has proposed a new 23.4 mile, 26-inch diameter pipeline in New York to expand its existing Williams fracked gas transmission system. The proposed pipeline will originate in Lancaster, PA travel across NJ, under the Raritan Bay from Old Bridge, NJ to the land in the Rockaway Peninsula in NYC. We oppose this project because of the negative impacts to our climate, health, safety and democracy. Our air quality, water quality, marine animals and habitat destruction that may result from this project's construction and operation. The pipeline could also negatively impact ocean and coastal uses such as beach going, surfing, diving, boating, kayaking, and fishing during construction. We are also concerned with the dire impacts from the further burning of fossil fuels. This project will lock consumers into fossil fuel infrastructure for decades and increase the negative effects from climate change. In the case of a pipeline leak, thousands of pounds of greenhouse gases could be released, similar to what happened in California. JOIN US AND STOP THIS PIPELINE! 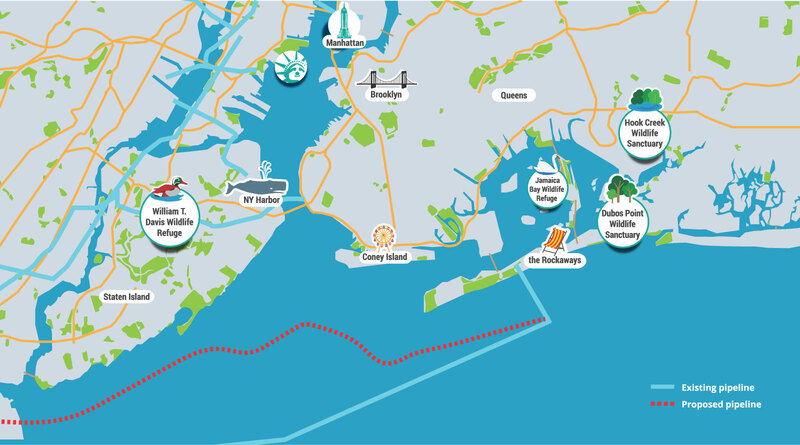 The Williams energy company is proposing to build a 23-mile long pipeline that will carry fracked natural gas (methane) under New York harbor. The pipeline would run along the coast of Staten Island then cross the harbor south of Brooklyn to join existing pipelines four miles off the Rockaways. There are many reasons to oppose this pipeline. THE PIPELINE IS BOTH UNNECESSARY AND EXPENSIVE. National Grid would be buying this gas. However, a pipeline to Brooklyn just completed in 2015 doubled their available gas. Yet over the next 10 years the demand for natural gas should fall as New York switches to renewables, as we see with the success of the new offshore wind project slated for the nearby area to service the same customers. Plus, the estimated cost of this pipeline is nearly a billion dollars, a cost National Grid customers would have to pick up. CONSTRUCTION WILL HARM BOTH HUMAN AND MARINE LIFE. WILLIAMS HAS A POOR SAFETY RECORD. THIS PIPELINE IS INCOMPATIBLE WITH FIGHTING CLIMATE CHANGE. While natural gas is often touted as less dangerous to the climate than coal and petroleum, it is in fact just as dangerous. Its primary component is methane, and methane in the first twenty years after its release is 86 times more potent a green house gas than carbon dioxide. Even in the absence of accidents, the routine fracking, processing, and transportation of natural gas releases substantial amounts of methane into the atmosphere. New York City’s “80x50” program commits us to reducing greenhouse gas emissions by 40% by 2030. And New York State’s Clean Energy Standard commits the state to getting 50% of its electricity from renewable sources by 2030. We will need less fracked gas, not more, to accomplish this.